Never have two words struck such despair in the hearts of parents and students. 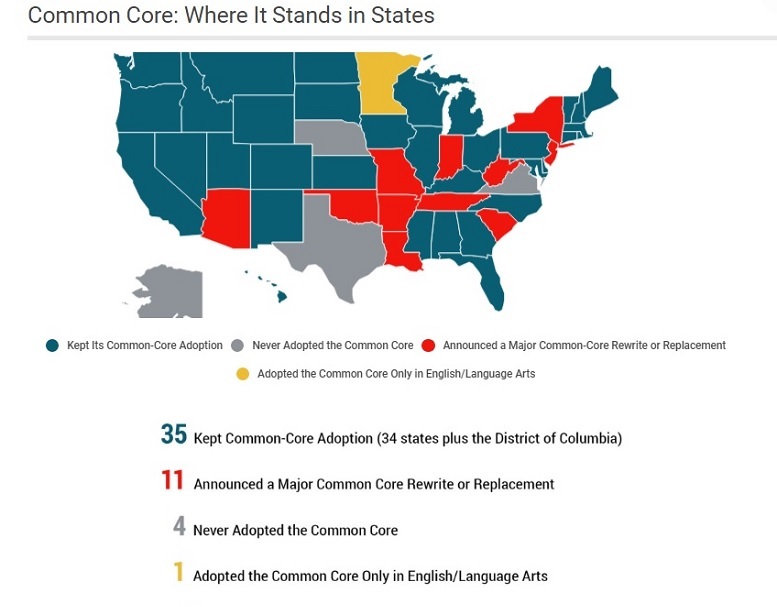 The majority of states adopted and implemented Common Core between three and five years ago. Yes, my home state of North Carolina adopted and implemented Common Core too. The state is currently in year five of Common Core’s implementation, but you’d never know it from looking at test scores in the state which have been stagnant for years. The North Carolina Department of Public Instruction tucked the Common Core standards into use under the name the North Carolina Essential Standards, but it’s Common Core all the same. What strikes me is how little the public knows about the history of how North Carolina came to use Common Core, so I decided a history lesson was in order. Bear in mind while reading the following timeline that in 2009, Arne Duncan was the Secretary of Education. That year he made a special trip to North Carolina and gave a speech at an NGA symposium hosted, in part, by the Jim Hunt Institute. Superintendent Atkinson and Former Governor Perdue sign the Race to the Top Application. The North Carolina Department of Public Instruction’s complete Race To The Top application uses the Common Core State Standards by name as the standards the state will use to satisfy the ‘career and college ready’ requirement of the grant. Superintendent Atkinson, Governor Perdue and the State Board of Education sign off on Smarter Balanced Assessment Consortium’s ‘Memorandum of Understanding’. This consortium, known as the SBAC, is one of two consortia created to carry out Common Core-aligned testing. The Memorandum is another layer locking NC into the Common Core. The NC Board of Education adopts Common Core at the behest of Dr. Atkinson. Common Core was released by the CCSSO (Council of Chief State School Officers), NGA (National Governors Association) and Achieve, Inc. Yes, you read that correctly — Common Core was released after North Carolina put Common Core into their Race to the Top grant application and adopted the standards. NCGA brings Common Core in via Senate Bill 724. Common Core was inserted in Edition 3 of Senate Bill 724 and makes it through to ratification (SL 2012-77). Common Core was implemented in North Carolina Schools (K-12). Teachers are only made aware they will be using Common Core only a few months before the start of the school year. been able to answer how these field tests were paid for and no one has seen the results. North Carolina General Assembly begins to openly question Common Core and the SBAC. A Common Core Legislative Research Committee (LRC) is authorized. View the Committee’s files and meeting information at the General Assembly website. 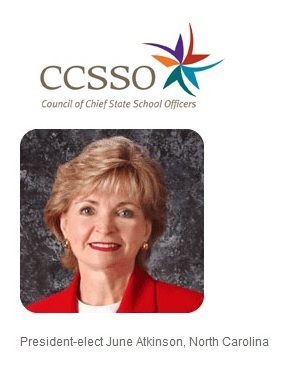 North Carolina’s Superintendent, Dr. Atkinson, was made President-Elect of the CCSSO, one of the three groups who created the Common Core and holds the copyright on the standards. Local media fails to report on this connection. The North Carolina General Assembly’s Common Core LRC produces a report which is critical of Common Core and suggests a replacement. A draft of this replacement bill was entered into the LRC report, authored by Senator Tillman. This draft becomes Senate Bill 812. The House also created a bill, House Bill 1061. The language in 1061 was stronger; a tug of war ensued between the House and the Senate. Various groups including the NC Chamber of Commerce, who supports Common Core, launched an assault on 1061. In the end, Senate Bill 812’s language wins out. Senate Bill 812 Created An 11 member Academic Standards Review Commission (ASRC). View a comparison of the bills. The conference version of Senate Bill 812 passed both houses after exiting a Conference Committee and was sent to Governor McCrory, who signed it on July 22nd, 2014. Appointments to the Academic Standards Review Commission (ASRC) were made. Board of Education members. 1 businessman was appointed by Governor McCrory. Despite multiple parents and experts applying, there were no early childhood experts or parents from the general public were chosen to serve on the commission. These appointments were made by former Speaker and now North Carolina State Senator Thom Tillis. These appointments were made by General Assembly Senator Phil Berger. According to SB 812, the ASRC was expected to do a comprehensive review of the standards and give recommendations for changes to the State Board of Education by the end of December 2015. September was the first meeting and Co-Chairs were elected (Andre Peek and Jeannie Metcalf). of funding kept the commission from bringing in speakers who might rebut the Common Core. Two work groups were formed to review the Common Core and look for the most egregious issues. The Math team was led by Dr. Ted Scheik & English Language Arts was led by Dr. Laurie McCollum. The first few meetings (Oct-Jan) were frustrating as the Dept of Public Instruction appeared to be running the show with lengthy presentations that were confusing and convoluted. Tammy Covil was elected Co-Chair in February after Metcalf stepped down. In late November 2015, information came to light that there was a group shadowing the work of the ASRC, but they had kept their meetings private. This shadow group was formed and led by education non-profit, BEST NC. 1. A number of the standards in K-5 (both ELA and math) are age and developmentally inappropriate. 2. The integrated math used in Common Core in middle and high school is deficient. 3. There are better math standards out there than Common Core. Minnesota is being looked at for math and Texas for English. There was a question as to why the gold standard for English (Massachusetts) was excluded. After pressure was brought to bear by various non-profits, the NC Chamber of Commerce, various Common Core advocates and the NC Department of Public Instruction, the ASRC scuttled their 15 months worth of work at their last and final meeting. The General Assembly, displeased at the results of the ASRC, puts together House Bill 657. The bill offers students a choice of traditional math or Common Core Integrated math. The bill gets stuck in committee and does not emerge. The Legislature ends the current session and the bill is essentially killed. At the same time that House Bill 657 was going on, the Department of Public Instruction was ‘revising’ the high school Common Core math, commonly known as Integrated Math. The revisions are mainly cosmetic. The Department of Public Instruction also announced that they will be looking at the K-5 math, but not until 2017. This means the state’s youngest learners would be subjected to more age and developmentally inappropriate math ‘strategies’ for yet another school year, jeopardizing the foundational math skills of these students. Since announcing the K-5 revision plans, the Department of Public Instruction has said nothing more on the topic. Without a new set of K-5 standards, it will be Common Core again for the 2017-18 school year. For more details on the ASRC or Common Core, visit my personal repository of NC Common Core related materials and articles. This article first appeared at American Lens News in November 2o16. This entry was posted in Academic Standards Review Commission, Am Lens, Common Core, LL1885 and tagged ASRC, Common Core, North Carolina. Bookmark the permalink.